AsianNet has exhibited at the National Hardware Show (NHS) four years in a row. 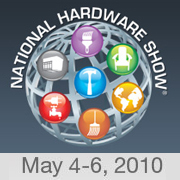 NHS is the largest hardware and homeware related trade exhibition in the United States. What's special about this year's NHS is the green product section which has attracted much attention. Green has become a popular theme these days. As in the last few NHS shows, AsianNet staff promoted our services to visitors and exhibitors from US and the neighboring countries, and, in the meantime, received feedback and fresh ideas about the industry. It is a good opportunity for us to meet buyers face to face, by matching their sourcing demands with manufacturers of innovative products in Asia.